Fantastic Foliage | Faddegon's Nursery, Inc. I think most of us are alike. When we think of annual and container gardening for the upcoming season, we think of flowers and lots of them! Flowers are the point of any garden, aren’t they? Yes, they are and that will never change, but putting some more thought into foliage can bring the best of all things growing. Just leaves, you say? No, not just leaves! 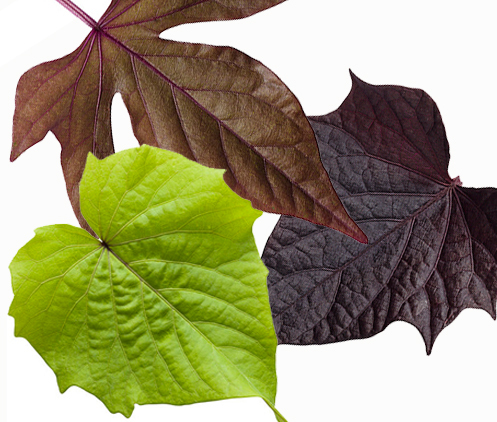 Amazing, colorful, patterned leaves of all sizes and shapes. There is so much variety in foliage that your design ability will soar and your flowers will be showcased in a way you didn’t know they could.This doorway gets a special treatment! Coordinated pottery filled with caladium, coleus, potato vine, and grasses looks wonderful even though flowers play almost no role in this grouping.Proven Winners has led the way in marrying foliage like coleus, begonia, and potato vine with annual flowers. This shade container uses some bright torenia around the lower tier of the planting, but the foliage is what sets it apart. The color choices give it a very elegant look.Coleus comes in a big range of colors and patterns. Most enjoy shade or part sun, although, in the past few years, several have been developed that tolerate fun sun! Coleus will flower but pinch those flowers off. They aren’t very noticeable and you’ll get more leaf growth without them.Begonias are the kings of striking leaf patterns and colors. The leaves of rex begonias can display up to 5 colors and twist or swirl. Anglewing begonias, an annual plant for us, get their name from the elongated leaf form. The planter on the right shows an angelwing with red blooms combined with Creeping Jenny, coleus, and a banana plant. Begonias want shade or part shade except for Bonfire® begonias which can take full sun.Caladiums are also known for the variety of pattern and color in their leaves. Morning sun only for caladium.Potato vines can be a major piece of any annual container. Better yet, they will grow in sun or shade! Potato vines and grasses make up this lovely container garden. Some of the big boys of the foliage worldColocasia, also known as Elephant Ears, range from small ( 10″ long leaves) to huge, with leaves measuring 28″ long (such as the one pictured on the right). Grown from plants or bulbs, they grow very quickly during the warm months and can be wintered over for next year’s show. Either combined with other plants in a container or on their own, they are an impressive addition to outdoor gardens. They can be grown in full or part sun.Banana plants can get up to 9′ tall or more when kept from year to year. They provide an outstanding look in the midst of other tropicals put outside for the summer. They also look great planted in a whiskey barrel or other large container surrounded with coleus and begonias. Can be planted in part to full sun.The variegated leaves of a ‘Benjamina’ ficus (left) are stunning, especially when they play with the larger leaved plants such as a red cordyline (middle) or a fiddle leaf fig (right). These three will want the protection of your home during the winter but are happy to be outside in the summer. Put in shade or part shade.The gorgeous fresh green and spotted pattern of this dieffenbachia can’t help but make you feel good! Combine it with containers featuring pink, orange, or red flowers and you’ll get a very striking look. Shade or part shade for this plant.A croton can definitely stand on its own. The fiery colors of this plant are incredibly dramatic and may drown out any flowers nearby! Set it outside during the season by itself or near other bold foliage plants in part sun.